﻿What kind of hip problems problems can I treat? The hip is often affected by osteoarthritis. Osteoarthritis occurs when wear and tear of the articular cartilage in the joint exceeds the body's ability to repair it and a combination of inflammation, bony remodelling and eventual thickening and tightening of the soft tissues around the joint causes pain and reduced mobility. As an osteopath I am interested in 'why this joint and why now?' so I will be keen to identify asymmetries and peculiarities in how you use your body to try and find ways of reducing any inappropriate stresses on the affected joint and so limit future wear and tear with the aim of slowing or even halting joint deterioration. At the same time, patients with OA of the hip tend to start to use a reduced range of motion, partly in response to pain and partly because, particularly in the early stages, muscles tend to guard the joint, even though this has a negative long-term effect. My treatment will work to gently stretch and ensure that your hip joint is taken through its maximum range of motion, preserving that range for as long as possible and ensuring that movement drives synovial fluid around the joint, and thus provides nutrition to the remaining articular cartilage. There are a number of muscles acting over or around the hip and thigh which can become strained or can be prone to inflammation of the tendon, both of which can cause pain. My role is to identify the problem, find out why the particular muscles are being overworked and becoming strained. Often this is because a joint or muscle elsewhere isn't doing its job properly, or there is a postural problem and this muscle is having to work harder. 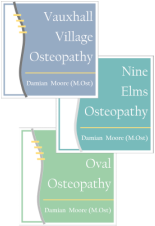 Osteopathy can be very effective in treating these imbalances and I will also be able to help you to adjust your activities in the short term to promote healing. Snapping hip occurs when tendons are inflamed and flick over bony prominences, this can be over the bony bit on the side of the thigh or can be more towards the groin, where there are other, deeper, bony prominences. It can be quite disconcerting and can often be effectively treated using the same process as other muscular imbalances. Where tendons pass over bones, there is often a fat pad or fluid filled sac, designed to reduce friction and provide protection. If they are irritated too much they can become inflamed and painful. The heat and redness can be very obvious, but not always. The osteopathic approach here is to reduce that inflammation by understanding, and resolving where possible, the excess forces impacting on the structure, often these are exactly the same forces causing tendinitis or muscle strains and often patients have elements of more than one of these conditions at the same time. A very impressive name for a numb feeling over the outside of your thigh. It is caused by entrapment of the 'lateral cutaneous nerve of thigh' under the inguinal ligament. This can be for a number of reasons, the space here is quite limited and can be affected by posture, muscle tone, fluid retention, all of which I can influence with treatment, other causes such as pregnancy, fat (including lypidystrophic changes) and hernias are less amenable directly but often working on the things I can influence is enough to allow the body to cope with those I can't. A similar effect may also occur to the femoral nerve which also passes beneath the inguinal ligament and supplies sensation to the front of the thigh as well as the nerve supply to your quadriceps muscles (the big muscles on the front of the leg) amongst others. There are other conditions which can cause pain in the hip area including hernias, infections and circulatory problems. If there is good reason to believe that your problem does not have a musculo-skeletal mechanical cause I will always refer you as necessary.